All The World's A Fomite: Mumsy, is that you? 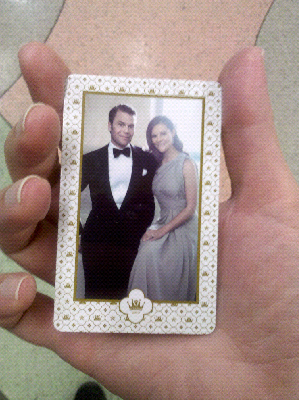 Commuter cards with a photo of the crown princess and her prince were released around the time of the royal wedding last year. They supposedly sold out quickly, but I somehow got this when I purchased a new card at KS Solna a few weeks ago. As The Big Niece and I waited at a dimly lit bus stop on Saturday evening, I showed her the card and figured we were going to talk princesses since she's at that age. Instead, she cut me off and declared "That's just Farmor!"